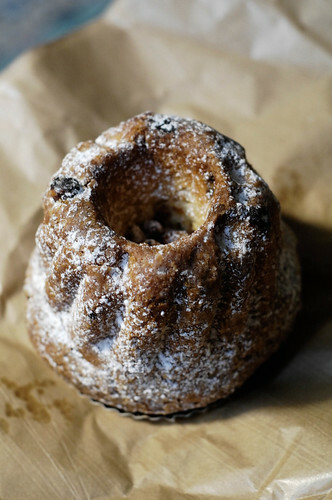 Are you familiar with kugelhopf, sometimes called kougloff? Imagine a yeasted coffee cake from Alsace, not too sweet, studded with golden raisins and hazelnuts and brushed with melted butter, sugar and orange flower water. The cake part is light and brioche-like (though not quite as buttery) and the exterior has a fine crust from the sugar. TIn case I haven't made it sufficiently clear, it tastes amazing. On to the mystery: last year, after sampling kugelhopf on our last trip to France, Mark made it for my brother, sister, and me. It was delicious, especially with coffee, and we made a sizeable dent in it by the end of the evening. When we went to bed that night, fully half of the kugelhopf remained. 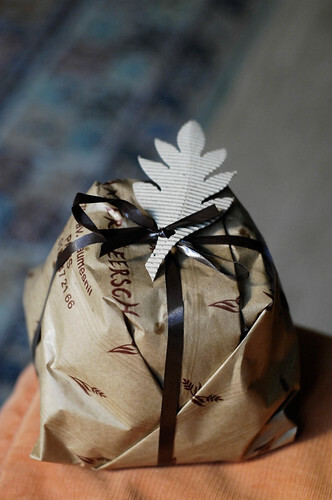 The next day, Mark unwrapped the kugelhopf sitting on the counter, and to his shock and horror (!) less than one quarter of the kugelhopf was there. The usual suspects were questioned, to no avail. My brother, who has been known to eat late night snacks, denied it. My sister, too, denied it. I definitely didn't eat it. And we all maintained that if we had eaten it, we would have admitted it. Mark was stricken. Who ate the kugelhopf? Later that morning, I spied Mark's robe lying on the floor next to his side of the bed, when it is normally hanging on a hook in the bathroom. How singular, I said, with my best Sherlock Holmes frown. Why would your robe be there? Mark shrugged. And then, with a faraway look in his eye, he remembered a strange dream he had the night before. He had been in our kitchen, wearing his robe and getting a drink of water. I asked him if he was sure it was a dream, and whether he also remembered eating kugelhopf in his dream. "No way," he said. "The robe on the floor is strange but I didn't eat the kugelhopf. Someone got to enjoy that kugelhopf, and it wasn't me!" And there the mystery ends... for Mark. But if you're me, and my brother, and my sister, it is totally evident that Mark sleep-walked his way to the kitchen and gobbled up the kugelhopf. The end. Now we're in Paris, and a bakery makes delicious kugelhopf and sells it by the kilo. We've bought it twice and it is excellent. Mark has limited his consumption to waking hours so far, but perhaps only because we have guests on the sofa bed who would surely notice any sleep-eating activities. I'll keep you updated.